The aircraft is designed to carry as many as three satellite-laden rockets at a time under the centre of its enormous wing. Stratolaunch Systems Corp. chief executive Jean Floyd said on April 13, the aircraft made a “spectacular” landing that was on the mark. 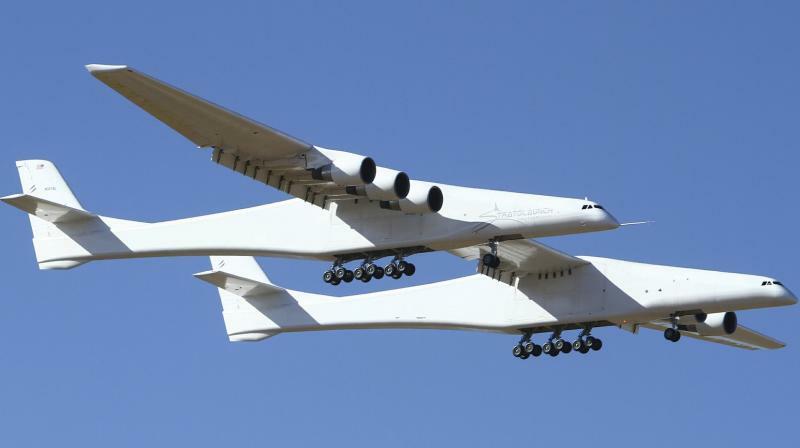 Stratolaunch, which was founded by Allen, is vying to be a contender in the market for air-launching small satellites. He died in October. “It was an emotional moment for me, to personally watch this majestic bird take flight, to see Paul Allen’s dream comes to life in front of my very eyes,” Floyd told a teleconference briefing. The behemoth, twin-fuselage Stratolaunch jet lifted off from Mojave Air and Space Port shortly before 7 a.m. on April 13, and climbed into the desert sky 70 miles (112 kilometres) north of Los Angeles. The jet flew 2 ½ hours, achieving a maximum speed of 189 mph (304 kph) and altitudes up to 17,000 feet (5,181 meters), the company said. The aircraft is designed to carry as many as three satellite-laden rockets at a time under the centre of its enormous wing, which stretches 385 feet (117 meters) — a longer wingspan than any other aircraft. The previous wingspan leader was Howard Hughes’ World War II-era eight-engine H-4 Hercules flying boat — nicknamed the Spruce Goose. Surviving in an aviation museum, it has an approximately 320-foot (97.5-meter) wingspan but is just less than 219 feet (67 meters) long.